Are You Making Any of These 9 Common Data Backup Mistakes? We've all watched at least one movie or TV show where the police called for backup. From our TV and movie habits we also know what happens to those officers when they don't wait for backup – MAYHEM! What does this have to do with your business? Without a good backup strategy, your information could be subject to mayhem (or disappearing without a trace or being kidnapped). After all, when it comes to hard drives and servers there are two kinds – ones that have failed and ones that will fail. There’s no “if” here, only when. We wrote about how data backup can protect your information from ransomware last week, Data Backup Is an Extremely Effective Counter to Ransomware. Today, I want to further explain data backup and highlight a few common mistakes small business make. The key point to remember is that every company needs a data backup strategy that they adhere to. Backup isn't a nice-to-have IT piece; it's a must have. Storage, Backup, Same Thing, Right? First, storage, backup, and disaster recovery; they're all the same, right? Not quite. These are three different technologies and business functions dealing with how to maintain access to your information. Here's a quick tutorial. Saving information isn't a backup plan, let's get that clear. And backing up data on your laptop isn't what were talking about either! If you think that saving your information is a disaster recovery or business continuity plan, then you are very, very wrong. Storage. Storage is simply placing your information assets so that they can be found again. Information is commonly stored as paper, on tape, local hard drives, servers, or in the cloud. Cloud storage is a cloud computing model in which data is stored on remote servers (often from a third-party provider) accessed from the Internet, or "cloud." Backup and Recovery. Backup and recovery refers to the process of backing up data in case of a loss and setting up systems that allow that data recovery due to data loss. Backing up data requires copying and archiving computer data, so that it is accessible in case of data deletion or corruption. Data from an earlier time may only be recovered if it has been backed up. Data backup is a form of disaster recovery and should be part of any disaster recovery plan. Disaster Recovery Defined. A Disaster Recovery Plan (DRP) is a business plan that describes how work can be resumed quickly and effectively after a disaster that results in a major disruption of business. Disaster recovery planning is part of business continuity planning and applied to aspects of an organization that rely on an IT infrastructure to function. The overall idea is to develop a plan that will allow the IT department to recover enough data and system functionality to allow a business or organization to operate. 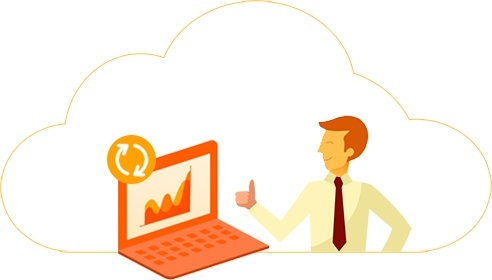 Here are some of the most common data backup mistakes small and medium businesses make (don't worry, with time, attention, and a little help – these mistake are EASILY correctable). No Backup. Depending on the research you like, the numbers vary, but a LARGE portion of SMBs don't back up their data at all or only some of it. When your business depends on continued access to critical business documents, it's simply crazy not to have a plan in place to save redundant copies of those documents and information and to retain access to them in the case of disaster (a disaster defined as ANY event that disrupts access to your information). Human error, hardware failure, or malware will cause lost data at some point for EVERY company. If you rely on information to run your business, yet have no plan for backup and recovery, you’re courting disaster. Inconsistent Backup. Set a backup plan and stick to it, whether that’s an incremental backup plan daily and a full backup at least weekly or maintaining virtual desktops so that you never lose more than minutes of data (not required by everyone). More infrequent backups, especially if you aren’t checking them frequently, will often reveal missing data (i.e., not noticing that two backups in a row failed). Let’s say you only backup data ever four months (or even only yearly). If disaster strikes, you could find a mess of incomplete, out-of-date, or inaccessible data making any recovered data essentially useless. How frequent should backup be for small businesses? A full weekly backup is often enough for most small businesses. Daily backups are suggested for regular work with client data and/or for businesses in regulated industries. Forget Your Other Offices – Including Working at Home. As businesses become geographically dispersed you need to plan for protecting assets wherever they are. Employees who telecommute will work offline and might even use their own system to save work. Don’t forget to backup information on laptops and PCs outside of the four walls of the company HQ. This is even more important for regulated business. Ignore Mobile Devices. Your employees are accessing email and even documents on their phones and tablets. 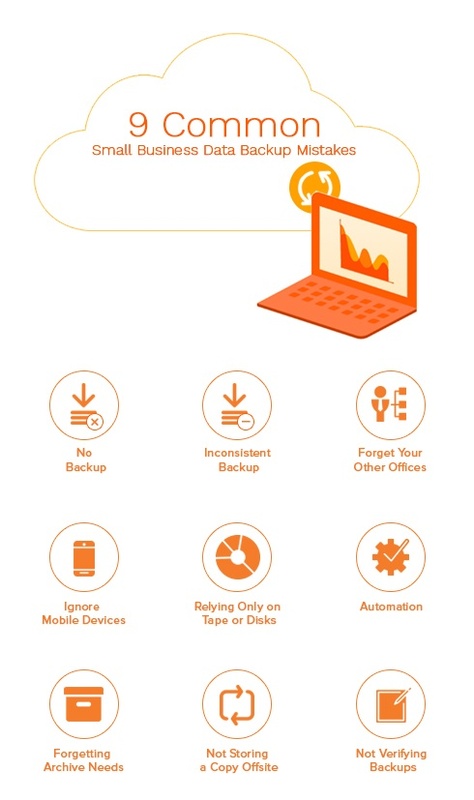 Don’t ignore the challenge of backup for mobile devices. Relying Only on Tape or Disks. Tape and disk backup continue to be relevant pieces of the backup puzzle. But don’t ignore cloud backup solutions because of unfounded concerns over security. Physical backups can be lost or destroyed – and you don’t even need a real disaster for that to happen. Tape is, well, tape and can break. Disks can overheat. Forgetting Archive Needs. Backup is not archive – long-term storage. Be sure to research and understand your regulatory needs for keeping records. Information that is required for archival/records management needs will have additional retrieval and auditing requirements, particularly in the event of rediscovery. Not Storing a Copy Offsite. If you keep your backup tapes in the server room, you have no recovery ability in the case of a fire. Keep your information in at least two locations, which is one driver for an outsourced service, who will also duplicate your data in multiple locations. Physical OR electronic, just be sure to have your backup information in different locations – and that doesn’t mean different rooms or floors in the same building; it means a different building. Not Verifying Backups. Don’t assume that everything is working – you need to double-check to ensure the system is doing the job. You can manually look to see if a photo or document recently created has been backed up. Now that you know the most common mistakes SMBs make, it's time for you to check the status of YOUR backup strategy. First, make sure you have one! Backing up your laptop hard drive doesn't count as a strategy either. Seriously, check with your IT team – are they making any of these mistakes? Can they show you proof that they aren't? If not, or if you don't have an IT team to check with, you should at least consider outsourcing data backup. If you've seen one of those Carbonite commercials, you'll understand the essentials of outsourced data backup: your data is backed up by a cloud service at regular intervals. Data backup has been available as an outsourced service for over a decade. It works. You don't have to worry about it. As your data needs grow, you can cheaply and easily buy more storage space. When you work with a managed network partner, it's a killer combination that removes a load of hassle from your IT's staff plate and can be more cost-effective because you don't have to invest in the infrastructure yourself. You can execute a perfect backup strategy on your own if you spend the time, attention, and resources to put one in place. If you don't have the time, talk to a partner who can ensure continued access to your vital business information – and, even more importantly, can ensure you have a plan in place to continue business operations in case of disaster.